In the height of summer it is filled with tourist cars – but for the next few weeks it will be filled with massive lumps of rock. 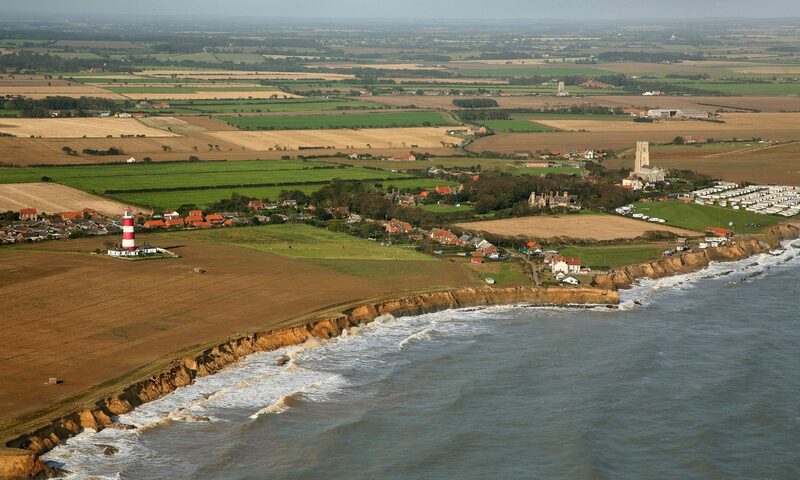 The council car park on the clifftop at Happisburgh has been turned overnight into the holding area for hundreds of tonnes of rock, which will be used to create a new sea defence scheme for the village. Deliveries started today for the project, which will take several weeks and is being led by North Norfolk District Council. The main £200,000 funding for the scheme has been provided by the council, with the village and its supporters making their own donation. That donation already stands at about £50,000 once the gift aid tax forms have been processed, but fundraising is continuing. For the villagers it is much more than a simple sea defence scheme – for those on the very front line it means saving their houses from the encroaching sea. “We have been redrawing our plans for the next few years because of this,” said Di Wrightson, who lives in Cliff House on Beach Road, where her clifftop back garden has gradually been disappearing into the sea. “Instead of thinking about moving out in the next few months, we are looking at a possible extension of three to five years, although it is very hard to be exact. Miss Wrightson said the generosity of those who had given their own cash to top up the council pot had been “staggering”. And she added: “You can’t help feeling people have almost been waiting to give money, but wanted to wait until they knew it would be useful. Malcolm Kerby, coordinator of the Coastal Concern Action Group, said the number of deliveries had dropped from an expected 12 flatbed lorries per day to about eight because the quarry supplying the material was also sending rock to a similar project in Felixstowe. But instead of being disappointed at the news, he was delighted. “It demonstrates what I have been saying for a long time, there are many other communities around the coast which are in the same position as us. The first phase of the project will see rock stockpiled on the car park and on the field at the end of Beach Road. At some stage the rock will start being dropped onto the beach, after which it will be engineered into a two-metre high sill. Tides and the weather will be a significant factor in how long the work takes to complete. To make a donation, call in to the village post office or log on to www.buyarockforhappisburgh.com where details of several payment methods are given.